The French broadcaster BFMTV found voters had a more favourable view of Mr Macron than Ms Le Pen in most categories. He was the "most convincing" of the pair in the opinion of 63% of viewers. Ms Le Pen lambasted her rival for his finance and government background, accusing him of being "the candidate of savage globalisation" and said his version of France "is a trading room, where it will be everyone fighting for themselves". In turn, Mr Macron said the National Front leader openly lied, proposed nothing, and exaggerated the concerns of the public. "The high priestess of fear is sitting before me," he said. Both candidates were hoping to make an impression on the estimated 18% of undecided voters in the first election the country has ever held without a candidate from the two traditional mainstream parties. The second round run-off between the pair takes place on Sunday. This turned into a tense, at times incendiary exchange between two leaders with starkly opposing ideas about the road France needs to take. Marine Le Pen, who lags badly in the opinion polls, had clearly decided that the best tactic was to launch a full-frontal attack on Emmanuel Macron. Constantly throughout the debate she threw insults and allegations at him, accusing him of being part of the discredited existing order. 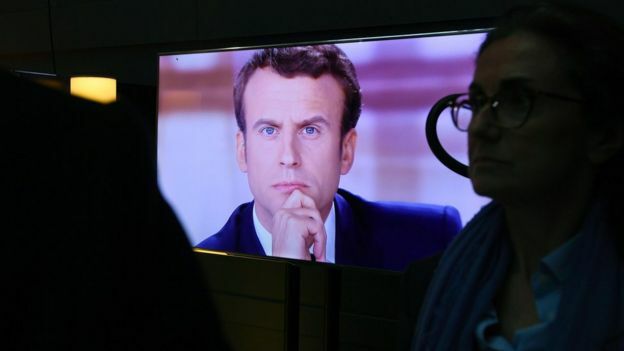 But there was little substance to her attacks, and over and again Emmanuel Macron was able to expose the weaknesses in her arguments - especially over the economy and the euro. The debate will have done nothing to alter his position as clear favourite in Sunday's vote. French presidential candidate Emmanuel Macron was more impressive than rival Marine Le Pen in Wednesday evening's final TV debate, a viewers' poll says. The candidates traded insults for more than two hours, arguing over terrorism, the economy, and Europe, BBC reports.